Crack some zombie skulls in this brain-splattering survival horror adventure. 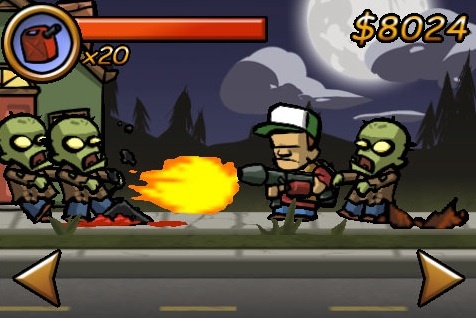 Of all the zombie games on iPhone, Zombieville USA is one of the most enjoyable. Designed by Kelli Noda, this $2.99 app lets you tear through an average looking neighborhood with a wide assortment of boom sticks that help transform the undead hordes into piles of mush. It's harder than a peach pit, but with a little practice, you'll burn, blow up and shoot hundreds of monsters in no time. 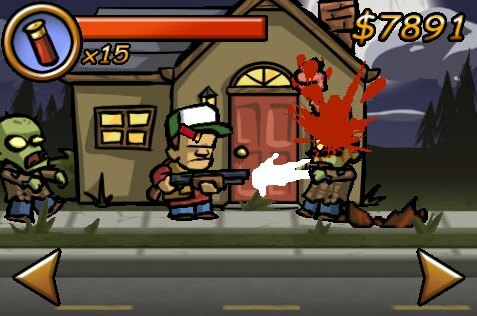 Zombieville USA casts you as a hat/vest wearing good old boy (known in some circles as a redneck) charged with slaughtering hordes of the undead. To play, simply press the left and right arrows on the screen to move in those directions and tap the bottom of the screen to fire. While easy to learn and fun, the game chugs whenever too many enemies clog the screen. This makes rapid fire with the pistol much too difficult and leaves you wide open to attack. Just keep that in mind as you wander the streets. You start the game with a pistol and, through killing enemies and entering homes, earn enough cash to purchase 14 other weapons, a delightful list that includes a shotgun, automatic rifle, flamethrower, bazooka and even a chainsaw. Acquiring these toys, however, will take lots of patience and plenty of skill. Zombies randomly pop up from the ground and despite their slow movements, can quickly gang up on you. To avoid becoming lunch, you can either blow their brains out or duck into a house. Doing the latter is a good idea since A.) you cannot take damage inside someone's home and B.) you'll pick up money or ammo. Completing a level is as simple as walking from point A to point B, but it takes more than fast feet to survive. As you progress through the game, the zombies become more difficult to kill, so it's best to use the earlier levels to destroy as many creatures as possible so that you can pick up a superior weapon; by Level 5, the pistol is almost useless. Although it has limited 2-D scenery, Zombieville USA is one of the iPhone's most attractive video games. Backgrounds feature a glowing full moon, a landscape dotted with trees, some houses and plenty of zombies to blast. Little touches, like the shotgun's kickback and the animation that occurs whenever a zombie bursts through the sidewalk, add to the charm. It's also one of the goriest games we've seen, with plenty of exploding heads; you'll love mowing down waves of zombies and watching their brains fly through the air. Aside from the aforementioned stability issue (and this is more of a personal thing), we wish this game had a melee attack. If you run out of ammo, there's no way to dodge zombies or push them off you; the game forces you to take damage. We'd love to see a knife attack in a future update. Unless zombies make you squeamish, you'll enjoy visiting Zombieville USA. Its stylish graphics, addictive gameplay and numerous weapons have made it one of our favorite games and yet another reason why owning an iPhone is a smart idea. What's Hot: Tons of carnage, 15 unique weapons, slick animation, spooky music and sharp graphics. What's Not: Lots of repeating scenery, game chugs whenever too many zombies appear, no melee attack.